The CJF2110.BA0594 TAG Heuer Link Automatic Chronograph Men’s Watch is classy and functional timepiece. Its refined look makes it a great watch for a hard-working business man, while its useful features make it perfect for the man who plays hard. The TAG Heuer Link Automatic Chronograph is a multifunctional watch made to match the style of most men. It offers four different dial color choices: black, silver, dark gray, and blue. Each dial comes with a hand-applied faceted index, as well as luminescent hands and hour markers that provide perfect legibility in darkness. 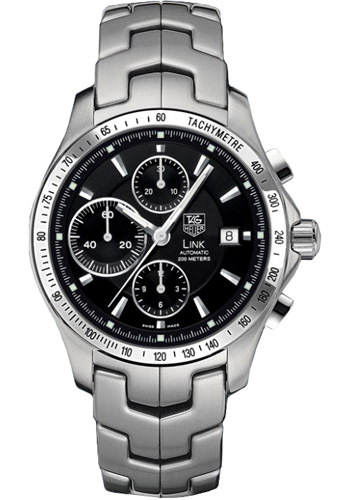 Also present on the dial is both a monochrome TAG Heuer logo and a “LINK – AUTOMATIC – 200 M” mark. The watch also features 3 subdials for the chronograph functions. The 12 o’clock subdial displays the seconds, the 9 o’clock subdial displays the minutes, and the 6 o’clock subdial displays the hours. Rounding out the dial area is a date window at the 3 o’clock position. Its polished steel bezel features a tachometer scale. The Link Automatic Chronograph features a Calibre 16. Automatic chronograph movement. Its case is stainless steel done in a satin finish, with shaped push buttons and a 42 mm diameter. The case back is done in sapphire crystal, which reveals the movement and gear trains. It also has openwork oscillating weight and a Côtes de Genève decoration. Its front crystal is made of scratch-resistant sapphire with double-sided anti-reflective coating both on the inside and outside, which gives wearers prestine dial visibility. The bracelet is done in an “s” link style and is satin-finish steel. A genteel and functional watch, the CJF2110.BA0594 TAG Heuer Link Automatic Chronograph men’s watch is a great timepiece for those who need a watch that transitions easily between work and play. I first purchased the CAF7011.BA0815 Aquaracer electro-mechanical but knew it wasn’t the watch I ultimately wanted. So I traded up to the WAF2011.BA0818 Aquaracer automatic, thinking this would be the one. Nope. The watch I really wanted but couldn’t find affordable until just recently is the watch I now am very proud and very pleased to own and wear, the beautiful and stylish CJF211A.BA0594 Link automatic day date with black dial. Now this is a watch to be admired and worn with pride but not a boastful attitude. It’s rated at 200 meter water resistance, oozes style and class yet is sporty as well. Man, am I happy to own this watch! It is almost identical to the CJF2110.BA0594 except the CJF211A has day & date, and the monochrome TAG Heuer logo is located above the day/date window. Also, the second hand subdial has a small monochrome band around the circumference. In addition, the hour names are applied around the inside of the bezel above the dial. Very cool! I am a very satisfied TAG Heuer timepiece owner.